Ammonite Electrical Services are a Quick find Directories vetted and recommended local business. A part P approved, insured, NICEIC domestic installer providing electrical services. 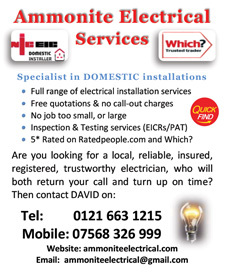 Local, reliable and professional electrician in Harborne, Edgbaston, Quinton, Birmingham and surrounding areas.